Actvity Summary: Students will model the rock cycle using Starburst candy and understand how rock may transform from one type to another. Students will also examine various types of rocks in follow-up activity. The rocks that make up the Earth are constantly being recycled. One form of rock is often changed into another form of rock through certain processes of nature that occur over time. 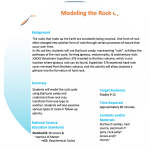 In this activity, students will use Starburst candy, representing “rock”, to follow the pathways of the rock cycle, forming igneous, metamorphic, & sedimentary rock. JOIDES Resolution Expedition 376 traveled to Brothers volcano, which is one location where igneous rock can be found. Expedition 376 examined hard-rock cores retrieved from Brothers volcano, and this activity will allow students a glimpse into the formation of hard rock.